Well we did it. We finally succumbed. 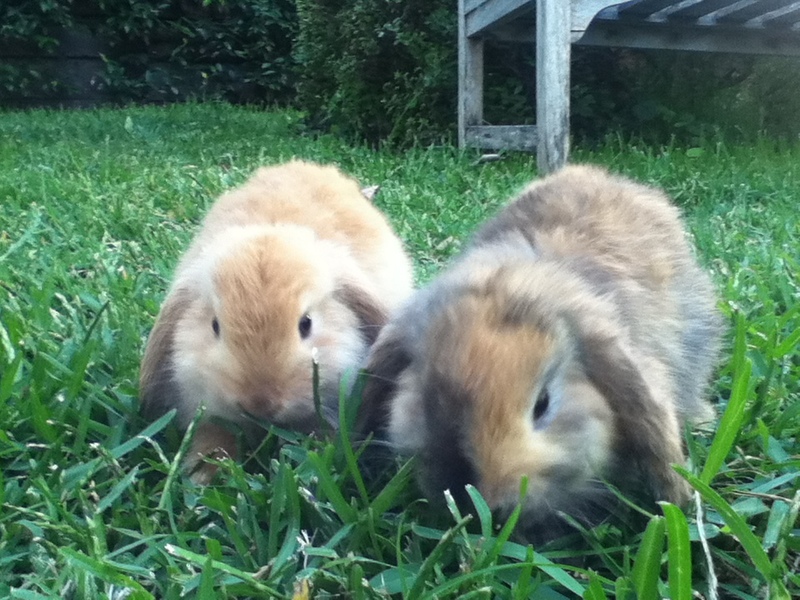 I never thought we would, but we are now the proud owners of two rabbits! And like all good decisions, we wonder why we didn’t do it sooner. Like all youngsters, the men-children always wanted a pet, specifically a puppy, which of course eventually grows into a dog. Like all practical parents, we always resisted having a pet, knowing that we would end up being the ones who walked it, fed it, took it to the vet, etc etc. Also with access to a beach house, we were often away on weekends, and the idea of having to either transport said pet or arrange to have it looked after on weekends or every time we went on holidays just seemed to be more pain than it was worth. Father of a Man-Child had a dog when he was young, so was definitely pet friendly. The only “pet” we had as kids was the mice we bought home from school and kept in the laundry for a weekend of babysitting. I am sure my mother hated having mice in the house. And if I’m honest, I probably wasn’t the biggest animal fan, most likely as a result of being bitten by a dog and a horse as a child – there’s bound to be psychological scars from that aren’t there? So it was naturally a surprise for the men-children when Sister of a Man-Child arrived home the other day to tell her brothers she was getting a rabbit! Their first reaction was disbelief, followed by a comment that they never had a pet so how come their sister was allowed to? 16 years old and sibling equality is still an issue. To be honest, it was a surprise to me that we had agreed ourselves. And it wasn’t even a planned decision. We are now the proud owners of Hazel and Squeak, two Mini Lop rabbits (a dwarf variety particularly good for smaller children) that have been an instant hit with the family. We decided to get two so they could keep each other company – apparently it makes them healthier and happier (oh and the pet shop richer)! Our daughter adores them, the men-children have also embraced them with open arms, and even we are enjoying them. On their first night we were all so worried that they would get cold outside that the hutch came into the laundry – soft touches! They’re also a hit with any visitors (and future babysitters)!! Our daughter is learning to care for them, and understanding the responsibility that comes with feeding, exercising and housing a pet. All good lessons for a child. And even though the boys are 16, I know they’re also coming home from school and checking on the rabbits. You’re never too old to love a pet. One week in and the joy of the new additions to our family remain. Let’s hope the novelty doesn’t wear off, and that Hazel and Squeak have a long, happy and healthy life.